This is my effort to link to all resources/viewpoints from all sides of this issue and it’s easiest to do when its in notes/letters form instead of facebook status. I will without doubt have missed a lot of the points, so please share what I’ve missed and I will add it. Whatever I have left out has not been on purpose, but because of the disorganized nature of Facebook discussions. On the bottom there is direct statements/evidence that doesn’t fit in the timeline. 04th August 2015 – Nemi Maharaja: No title and since it’s not a note, it’s not possible to link to. (Local version) Nemi Maharaja quotes this article about Bhaktisiddhanta Sarasvati Thakura. This is response to KBM statement from 23rd July 2015 (question number 3). Audio file of the quote. 2000: Syamarani didi: Is Srila Prabhupada In The Highest Rasa? sarva-bhüteñu—within all beings; yaù—who; paçyet—sees; bhagavad-bhävam—mood or bhäva towards Bhagavän; ätmanaù—his own; bhütäni—and all beings; bhagavati ätmani— within Bhagavän; eñaù—that person; bhägavata-uttamaù—is the uttama Bhägavata. 24th June 2015: Added Mukunda prabhus notes. Changed: The first KBM paper on your Timeline is actually entitled In the Transcendental World All are Very Sweet, dated March 4, 2015. Changed: The third KBM paper is entitled Priya Narma Sakha Subala is Not Sambhoga-Icchi-Mayi (in Sambhoga-Rasa). To Think so is Apasiddhanta. The date needs to be corrected to April 1, 2015. Changed: The original date on the 5th KBM paper entitled Srila AC Bhaktivedanta Swami Maharaja Reveals His Seva is May 29, 2015. Changed: Rebuttable to Mukunda dated March 18, 2015 was not generated by KBM, but by BV Suddhadvaiti Maharaja independently. 24th July 2015: Added lilasuka prabhus private darshan. 9th August 2015: Added Madana Gopal dasas statements in the evidence section. 24th August 2015: Added Bhakti Nandana Maharajas lecture on SP svarupa. 30th August 2015: Added postings by Bhagavat Maharaja and Syamarani didi in the evidence section. 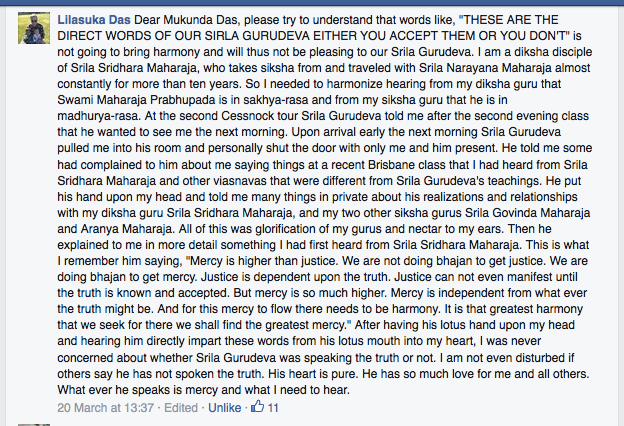 Gurudeva declaring our Srila Prabhupada to be a Sakha of any kind? As KBM are trying to use this quote as evidence of Srila A.C Bhaktivedanta Swami Prabhupada being in Sakhya rasa. Wonderful ! Thank you for pointing this out. I’ve changed the timeline accordingly.